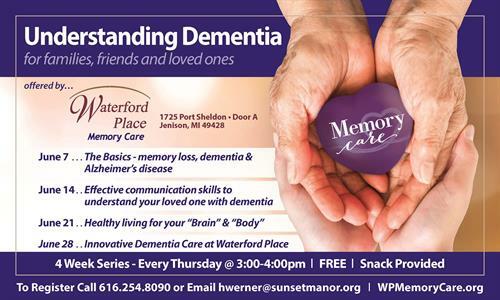 Understanding Dementia is a free, four-week class for families and loved ones dealing with the disease. June 21... Healthy living for your "Brain" & "Body"
1725 Port Sheldon, Jenison, MI - Door A - Snacks provided. June 7, 14, 21, and 28th from 3:00 - 4:00pm.